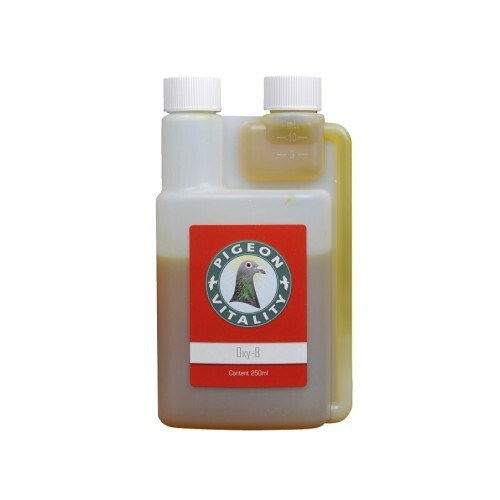 Oxy-B Liquid 500ml by Pigeon Vitality. The most important vitamins for lifting breeding and racing performance are no doubt the B-vitamins. This product contains them all as concentrates; – enriched with selected anti-oxidants! - B1 and B2 are important for healthy development and functioning of the muscles, nerves, and heart – also stimulate apetite! - B9 helps cells make and maintain DNA… THE most important vitamins for development of embryo and thus the breeders and YBs. Also, to improve fertility and calcium uptake we have added Vitamin D and Selene…great for the breeders, in particular the winter breeders, but also beneficial for the racers in the racing season! See the difference!